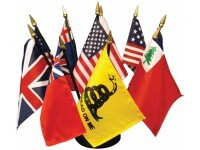 Set includes the following flags:BenningtonBetsy RossBritish Red EnsignBritish UnionContinentalCross of St. GeorgeGadsdenGrand UnionU.S. 15 StarsU.S. 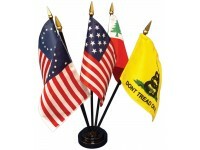 50 StarsEndura-Gloss (E-Gloss): Beautifully pri..
Set includes the following flags:BenningtonBetsy RossContinentalGadsdenU.S. 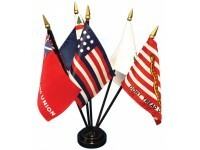 15 StarsEndura-Gloss (E-Gloss): Beautifully printed silk-like materialHemmed and sewn all 4 sides 4in x 6in mounted on 3..
Set includes the following flags:Bunker Hill1st Navy JackPine TreeSerapisTauntonEndura-Gloss (E-Gloss): Beautifully printed silk-like materialHemmed and sewn all 4 sides 4in x 6in mounted on 3/16i..